The Embraer E195-E2 flew for the first time on Wednesday, marking the start of a nearly two-year-long flight-test regime expected to culminate in Brazilian airworthiness certification in early 2019. The latest milestone for Embraer’s E2 program came at least three months earlier than the second-half 2017 date range the company originally targeted, meaning first flight of two of the three planned E2 variants has happened ahead of schedule. Speaking with AIN just after the two-hour maiden mission, Embraer Commercial Aircraft COO Luis Carlos Affonso stressed that the company’s ability to fly the airplane earlier than expected will not change delivery time frame plans. Although the two E195-E2 prototypes will need to fly fewer hours than will the four airplanes in the E190-E2 program due to several common systems, the fact that each model uses its own wing design means Embraer will have to perform a dedicated testing schedule to validate flying qualities and performance. 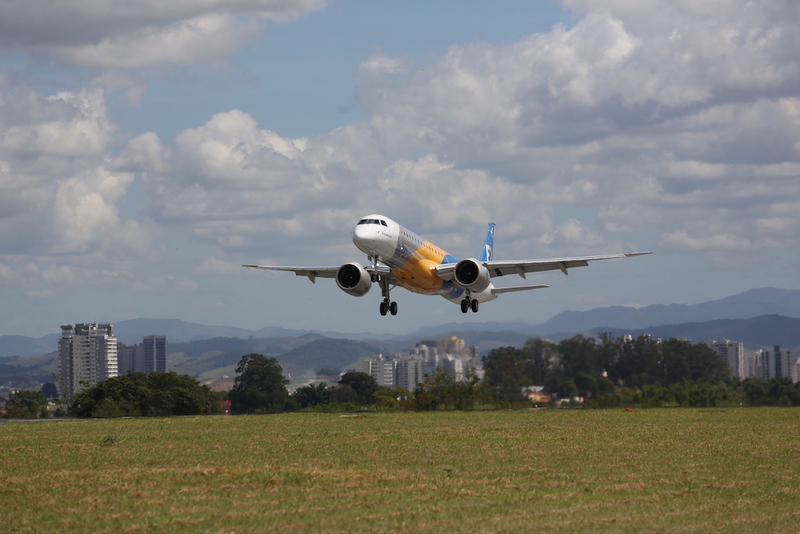 For first flight, the fly-by-wire-controlled narrowbody took off in normal mode, reflecting what Affonso referred to as “lots of confidence” in the flight control system as well as the airframe. During the mission crewmembers retracted landing gear, exercised every flap position and performed speed excursions to check handling qualities in preparation for landing. The crew then performed checks related to pressurization, APU function and autopilot, followed by 45 minutes of flying dedicated to air-to-air photography. The largest airplane ever built in Brazil, the E195-E2 can carry as many as 146 passengers in a single-class cabin layout and, typically, 120 passengers in a dual-class configuration. Powered by a pair of Pratt & Whitney PW1900G geared turbofans, the airplane can fly to a range of 2,450 nautical miles, some 450 nautical miles farther than originally specified at program launch in 2013. The increase in range comes from a change in the wing design in February 2016, when Embraer decided to add 1.4 meters (4.6 feet) of wingspan, thereby increasing aspect ratio, improving lift-to-drag ratio and allowing for an increase in maximum takeoff weight by 4,400 pounds. The original plan had involved two wing designs—one for the E175-E2 and the other for the E190/195-E2—using new automated technology on the same robotic station. The changes extend range by 450 nautical miles at sea-level starts and as much as 290 nautical miles in hot and high conditions. For example, the new wing would add 250 nautical miles to the previously quoted 1,700 nautical mile range from Denver. Launch customer Azul of Brazil, which holds a firm order for 30 of the new jets, still expects delivery of its first airplane—outfitted in a single-class, 130-seat cabin layout—in the first half of 2019. While Canadian competitor Bombardier considers its C Series narrowbody in a class all its own, Embraer sees the E195-E2 as a direct competitor to the CS100, notwithstanding the Brazilian airplane’s considerable range deficiency. “The [empty] weight of this aircraft is almost identical to the CS100 and yet because this aircraft is smarter by design in the materials that we’ve used, the E195-E2 can carry up to 10 percent more passengers than the CS100,” said Slattery. Bombardier specifies maximum capacity for the CS100 at 133 passengers. Embraer cannot argue against Bombardier’s claims of superior range, however. The CS100 can travel farther than 3,000 nautical miles with a full passenger load, giving it true transcontinental reach. In fact, it recently demonstrated it can fly nonstop from London City Airport to New York JFK in a 42-passenger configuration.